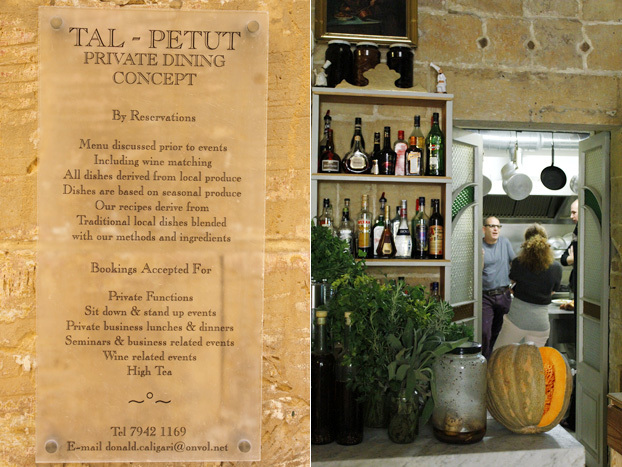 Tal-Petut private dining concept, Birgu (Vittoriosa), Malta, hosted a group of overseas travel & food bloggers last week. I am a regular at Tal-Petut, but I wondered what the small blogger group I’d joined would make of it on their first morning in Malta? 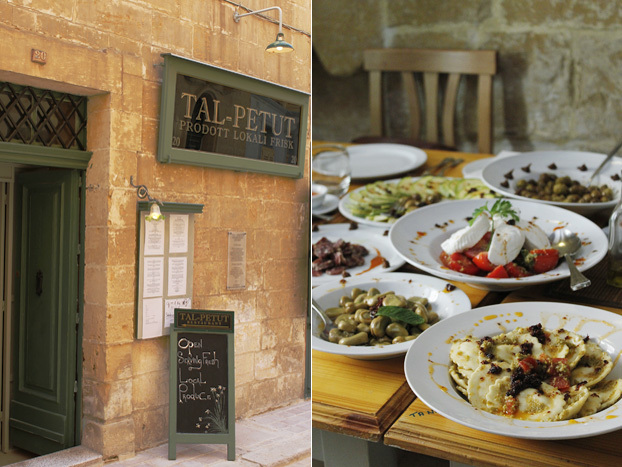 Tal-Petut is a rarity of a place to dine, defying definition and eschewing restaurant norms of menus, wine lists and maitre d’ routine and etiquette. It has few peers I know of in Malta; I’d even say none. It comes with a chef (correction: the man himself prefers the word ‘cook’) of singular repute. 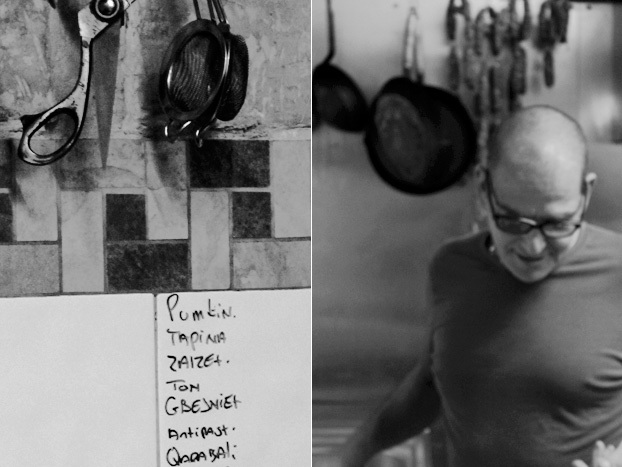 To dine at Tal-Petut is to get to know owner-cook Donald Caligari and his ‘four pillars’ of food wisdom on enjoying local ingredients at their best. 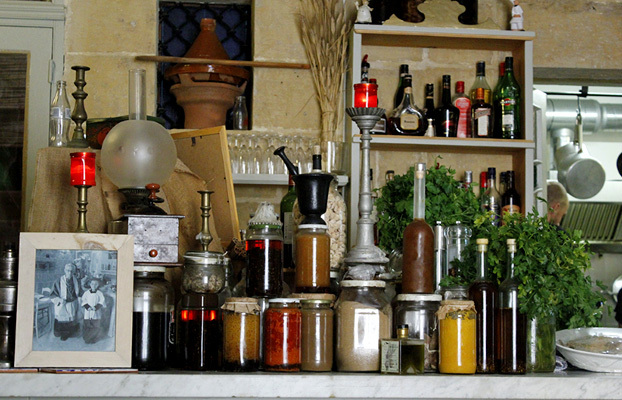 Tal-Petut is hidden away in a narrrow alley behind the Inquisitor’s Palace in Birgu, also named Vittoriosa, which is one of the ‘Three Cities’ across Grand Harbour from the capital Valletta. Discretion is its other name, as even on my third time dining there I nearly missed it. Let’s start with the name. Tal-Petut the building dates back around 500 years and was for a large part of the 20th century a local grocer’s run by the Petuts; Donald’s wife’s side of the family. Donald took on the building a good many years after the business had closed, reopening it under its old grocer’s name but with a new direction. There’s a photo inside of the local priest blessing Tal-Petut a couple of years ago. “He was so surprised, and pleased, to see it open as a version of Tal-Petut again,” says Donald. The sign, old marble shop counter top and the decor make you feel as if you’re stepping into that grocer’s of yesteryear. The front room (I use that term on purpose as the place does feel like a family home and kitchen) houses an assembly of jars of traditional homemade local produce from gbjeniet (goats’ cheeselets) to oils, chili sauces and sun-dried tomatoes along with bushels of herbs like sage, rosemary and mint. A long dining table has cabbages and lemons casually arranged but really there in readiness for kitchen use. Donald greeted us, chatting a few minutes on the doorstop about the curious term ‘private dining concept’ on the plaque outside. Tal-Petut is open for drop-in trade, but it’s best to make a reservation and discuss what’s on the menu that week or, to paraphrase a quote on the sign outside, see ‘…what gifts the land gives us’. Donald likes to spend time with his clientele, ensuring they have a slow, unhurried and also informative dining experience, fully versed on the ingredients. Tal-Petut really does feel as if you’re dining in someone’s home (in fact, Donald tells us ‘nana’s table is upstairs’!) with the cook giving you timely interjections on the dishes before you, tracing their route from their field/sea/market source via marinades, spices, herbs and prepping techniques all the way to their careful setting a tavola. “I am not about labels,” says Donald, telling us that he wouldn’t use the term slow food, nor would he wish to be pigeon holed by food guides. He turned away some Michelin Guide researchers for that reason. “I am not a chef, I’m a cook”, and “to understand food, you should study geography first not cuisine” are two of Donald’s favourite phrases that go some way to pinning the man and his concept down. As I’ve eaten here – exceptionally well I add – several times before this last week, I was familiar with Donald’s Four Pillars [of food wisdom]. For the bloggers, he’d jotted a quick aide memoire for his talk on the kitchen tiles: (1) Food Identity; (2) Produce Control; (3) Expectations; and (4) assorted notes about key ingredients. Geography, the way place, climate and people determine what’s on a region’s menu, is his pillar one. “I don’t invent the dishes,” he says. “I let the field decide. We don’t have microwaves, fryers or special equipment here. 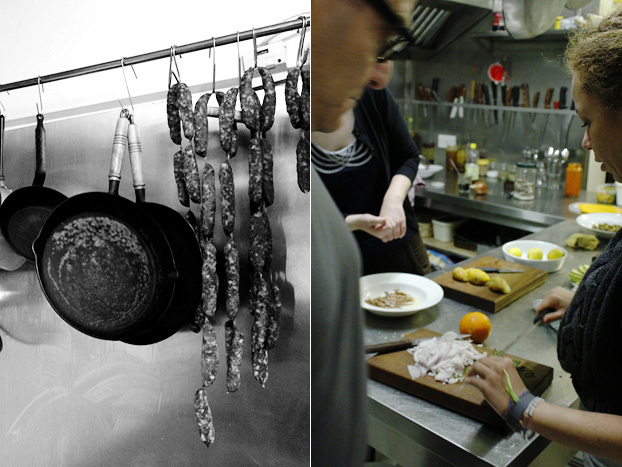 We just work with what’s seasonal and local.” Donald explains that he uses fresh, and fresh-preserved. Those counter top jars are discussed: the carob is left to dry for a year before being made into syrup; the salted tuna is a rare speciality that needs time to be at its best. Donald makes great use of the homemade preserving recipes handed down from the Petut family and his own forefathers. 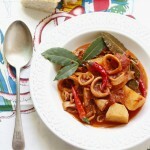 All our dishes had a squirt or splash of one or other, from dried fig puree’ to chili sauce and a marmalata. Produce control, pillar two, was in hand! Moving on to pillar three,’expectations’, the blogger group becomes a bit perplexed. What on earth is this about? Donald simply gives us an analogy. “If you come in the door having had a bad day, and order the most expensive bottle of wine, I’d say leave it. I’d rather you drank something cheaper as you aren’t going to enjoy a fine wine in that frame of mind. It’s psychology applied to dining. I try to ensure people relax the moment they walk in. It’s pointless having any dining experience otherwise.” Donald is obviously relaxed and in his milieu as he’s wearing his now almost signature flip-flops, and socks for now, as it’s a chilly spring. Pillar four gets back to some basics on cooking do’s and don’ts with a discussion on the use of oils. “Who uses olive oil to fry?”, asks Donald. 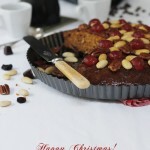 The blogger from Naples answers correctly, saying ‘never’. 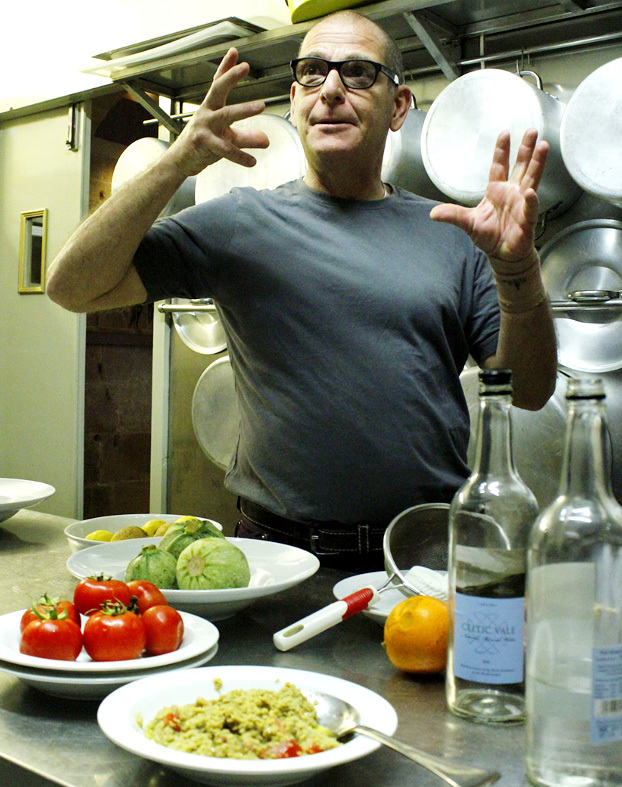 “Olive oil is nearly always too rich and deep a flavour to fry with, so we use corn oil and olive is reserved for dressings,” Donald explains. 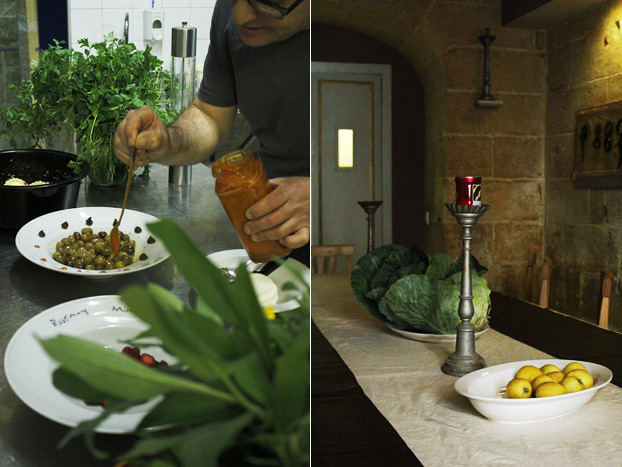 He has his own olive groves in the north of the island so knows a thing or two about the olive. We nod in agreement, making a mental note about corn oil as de rigeur. Four dips – Maltese bigilla (fava bean); pea; hummus; broad bean. Tal-Petut accommodates passing trade from couples to larger groups (though recommends booking and prior discussion of your needs). 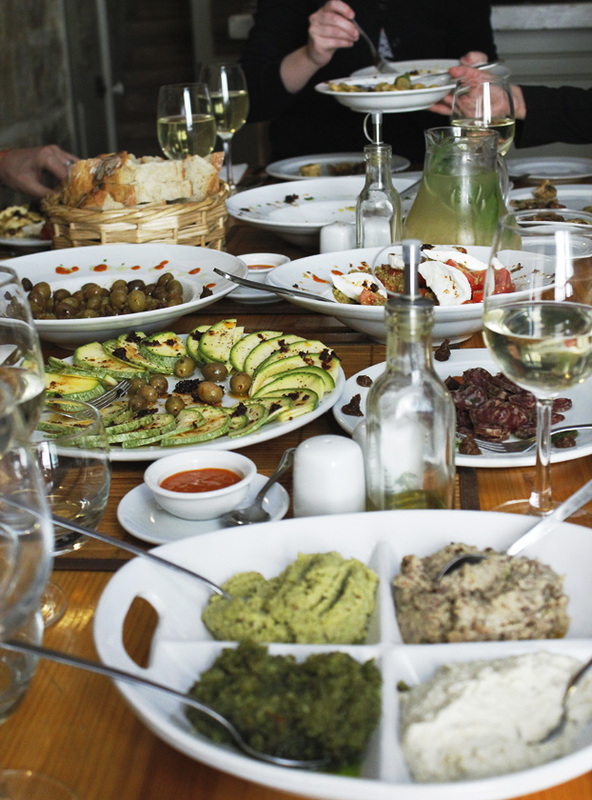 Best value is a full, five-course meal including Antipasti & Assaggi; Main Course (usually two meat /or a fish offer); Dessert, Digestivo, Caffe’. 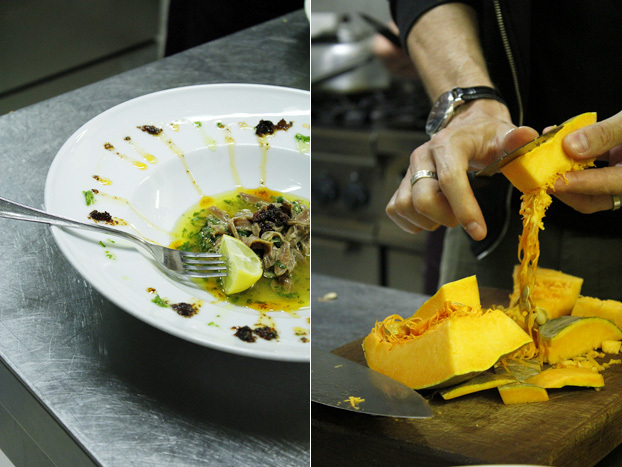 The Red Bistro would like to thank Donald & staff at Tal-Petut, Malta Tourism Authority and the BlogIsland blogger group for kind permission to join the cookery & tasting session. 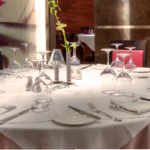 ah Lix – I wish I could be dining with you there in Malta! 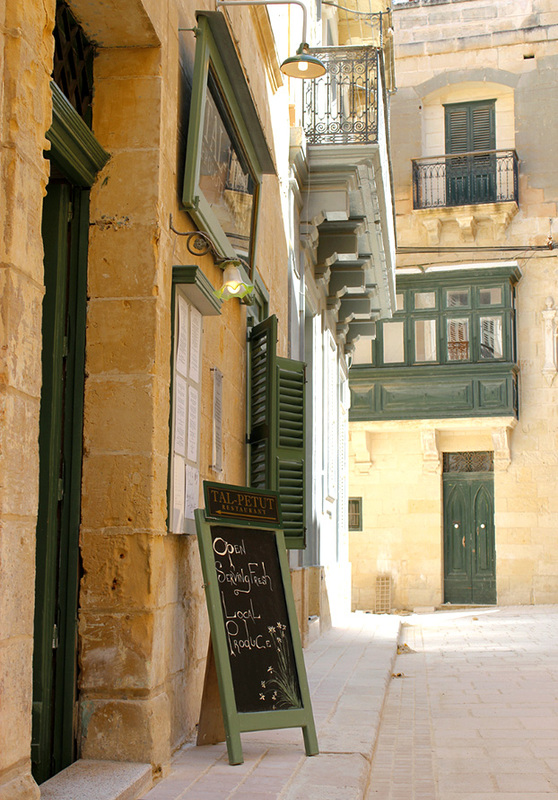 I scene in the narrow street had be hooked from the start – and then the story behind the cook owner – and lastly that wonderful Maltese food had be wanting to reach in and grab a fork. One day…..
Jill, I have a feeling your next European Grand Tour will bring you my way! 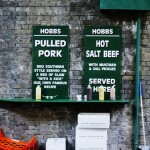 I do hope so, as I’d love to show you my favourite food haunts – Tal-Petut among them of course. Not all Malta is this evocative and old, as we’ve a lot of coastal resorts with that ubiquitous urban sprawl. But, sometimes small can be beautiful and at least it takes only a mere 20 minutes or less to get from A to B and from sprawl to truly amazing historic street like this one in Birgu. Malta does though have some gems like the Three Cities and its capital Valletta which have photos made in heaven leaping out from almost every angle. A photographer (and foodie) paradise if you know where to look and eat! As another regular at Tal-Petut i can only echo Red Bistro’s comments and look forward to my next visit – comfort food at its best! We have been there over Christmas and we had a ball. The food was exquisite and the old town house ambience works magic. Many of our guests have recommended it in our guest book – it seems to be a favourite with all. You’ve nailed it to a T ‘Indulgence Divine! It’s always an experience at Donald’s and your comment reminds me I need to head back there soon!